Halloumi is a very interesting cheese, that has a salty flavor profile that fits somewhere between Feta and Mozzarella to me. It is a very versatile cheese, and it is a lot of fun to make. My whole family loves this cheese when I make it this way, because it is a quick and easy Keto-friendly replica of Fried Mozzarella Sticks. 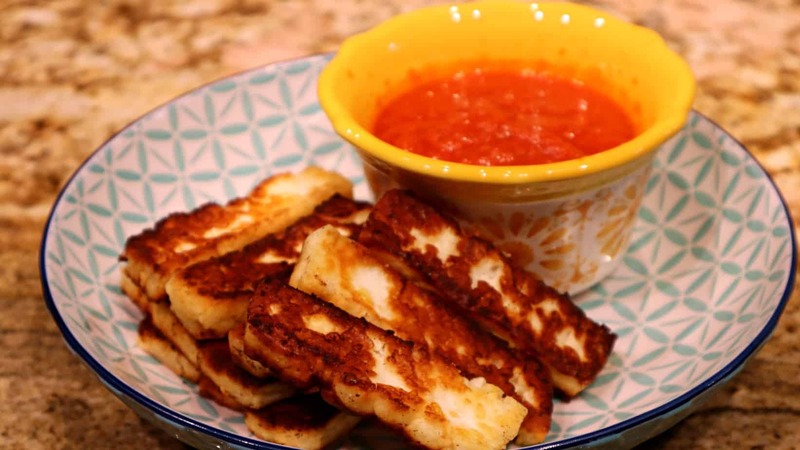 It can be very hard to find Halloumi cheese if you do not already know where to look, and the prices can vary wildly. Trader Joes carries it, but supposedly only in the Summer months and theirs is the cheapest I have found. I paid $4.99 for a 7 Ounce package at Trader Joes. Sprouts carries Halloumi year-round, but they charge $12.99 per 8 Ounce package near me, and I prefer the one from Trader Joes better. I use the Rao’s Sensitive Marinara Sauce because it is the lowest in Carbohydrates that I can find. It is not cheap, but on Keto a little bit can go a long way. Be sure to save your leftover sauce in the fridge, because you will only be using a single serving of the sauce spread out across all of these cheese sticks. If you cannot find the Sensitive Marinara, the normal Rao’s Marinara Sauce has only 1 more Net Carb so that’s also a good choice. If budget is more of a concern and you can spare 4 Net Carbs per 1/4 Cup you can opt for the Mezzetta’s Marinara Sauce instead for typically half the price of the Rao’s. In the recipe I call for Unsalted Butter specifically. Usually I just buy Salted Butter to cook everything, but Halloumi is already very salty tasting on its own. If you don’t have Unsalted Butter you can instead choose to pan fry the cheese in your choice of Olive Oil, Avocado Oil or similar. 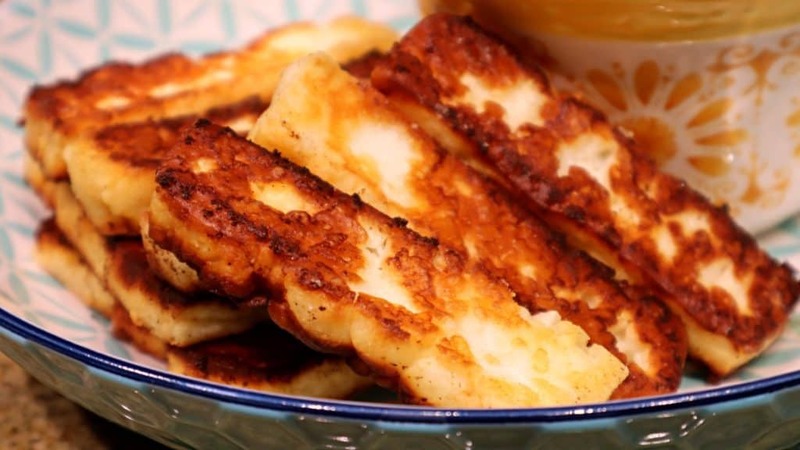 Slice the Halloumi into roughly 1 Inch thick strips and set aside. In a Large Non-Stick Frying Pan heat up some Unsalted Butter on Medium to Medium-High Heat. Be very careful not to turn the heat up high enough to burn the butter. I set my induction cooktop to about 275-290*F.
Once the Butter begins to bubble add the cheese and cook on each side until nice and brown. You want to intentionally give it a crisp outer crust, but without burning the cheese. Warm up 1/4 cup of the Rao’s Sensitive Marinara Sauce for dipping (totally optional). Serve Cheese Sticks warm and enjoy!